Summit Mt. Kilimanjaro and embark on a Tanzanian safari. The excitement of climbing Kilimanjaro and journeying through Tanzania’s finest game park makes this an ideal trip for all adventurers. 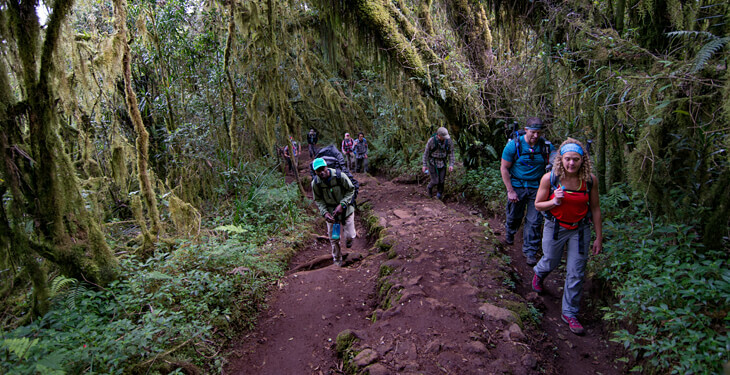 Join OneSeed Expeditions on an unforgettable journey up Africa's highest freestanding mountain via the Marangu Route. Begin by traversing the low-lying jungles, crossing through alpine scrub, and climbing through other-worldly terrain. 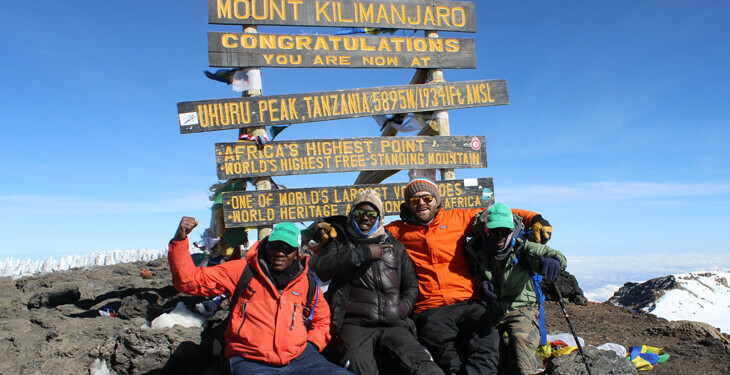 The balmy atmosphere will thin out to crisp, cool air as you ascend, taking a toll on your body and challenging you as you attempt to summit Uhuru Peak, the highest point in Africa. 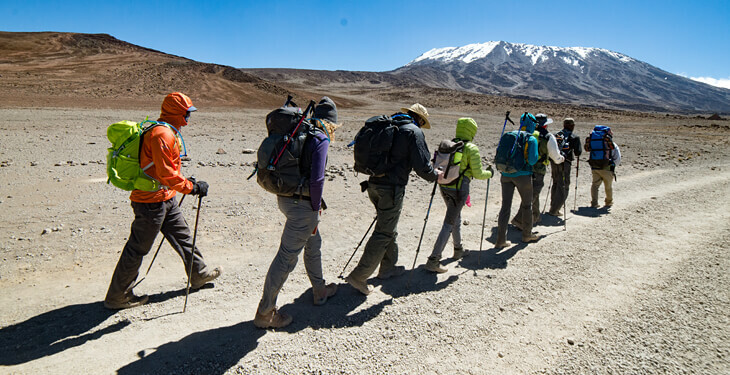 The Marangu route is Kilimanjaro's oldest, most iconic route, and this itinerary is designed to help you adapt to the altitude, giving you a higher chance of reaching the summit. Once you've seen Africa from above, you'll embark on a safari through the vast plains of the Serengeti, traveling to the wildlife viewing hotspots of Tarangire and Lake Manyara, as well as the incredible Ngorongoro Crater, a UNESCO Heritage Site which boasts one of the densest populations of lions on earth. Witness the annual wildebeest migration that stands as one of the world's most awe-inspiring natural spectacles. You'll have a chance to spot big cats, exotic birds, wild elephants, giraffes, hippos, and more during the three days of game drives and savannah camping that put the finishing touches on this once-in-a-lifetime experience. Arrive at Kilimanjaro International Airport, where the OneSeed team will be awaiting your arrival. From there you'll drive one hour to the town of Moshi (at an altitude of 2,800 ft / 853 m) to check into your lodge and catch up on sleep after your long trip. Join the rest of the group for a welcome dinner at the lodge. The adventure begins! An hour drive takes you to Kilimanjaro National Park. Travel light with your daypack and begin the ascent through the mossy rainforest. Keep your eyes open for monkeys in this lush area. Along the way, you'll stop at a picnic spot to enjoy a box lunch before continuing to ascend. Spend the first night on the trail at Mandara Hut, a solar powered, A-frame hut. Enjoy a delicious dinner before getting some well-deserved rest. The scenery today transitions from rainforest to moorland, and it's possible to catch your first glimpses of Kibo, the largest of Kilimanjaro's craters. Check out the area's unique plant life, with some species living for 100 years and growing up to 16 feet tall! You'll pass an ancient burial ground and learn about the local Chagga culture. Retire to Horombo Hut for the evening. Spend a rest day at Horombo Hut. To acclimate to the altitude, head out on a day hike to Zebra Rock, a geologic outcrop of stark black-and-white striped rocks in a beautiful setting. Don't forget to check out the star-covered sky at night. With almost no light pollution, the mountains are an astronomer's paradise. The hike continues through yet another microclimate, the alpine desert. This moon-like landscape gives you great views of the summit. 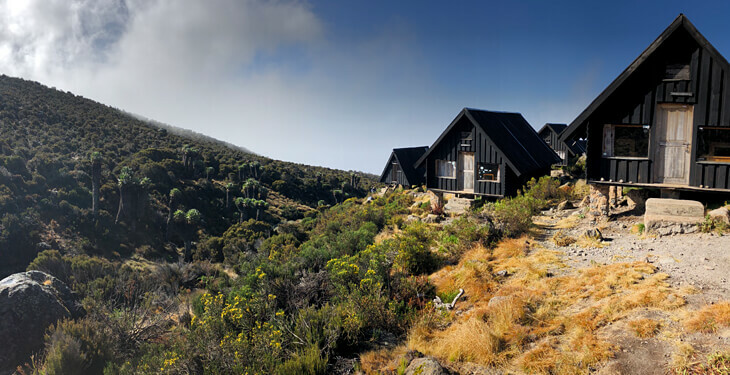 Reach Kibo Hut for some rest before heading out that same evening for your final ascent. Rise just before midnight to begin the long ascent to the top. Steep switchbacks lead you to the summit. The trail gains almost 4,000 feet as you reach the summit at 19,341 feet above sea level! With the crater on one side and a glacier on the other, this summit is positively breathtaking. Enjoy a beautiful view of the sunrise before you return to Kibo Hut and on to Horombo Hut for the night. Today you'll continue your descent back through the rainforest. Stop at Mandara Hut for lunch and continue all the way back to the park gates. Return to Moshi for a hot shower and a celebration dinner with your team. Time for safari! After departing Moshi around 9:00 am, the drive to Tarangire Park is a scenic, 4-hour ride. At the park, pop the roof of the car and begin a game drive. You'll have plenty of opportunities to spot elephants, ostriches, waterbucks, giraffes, and even lions! 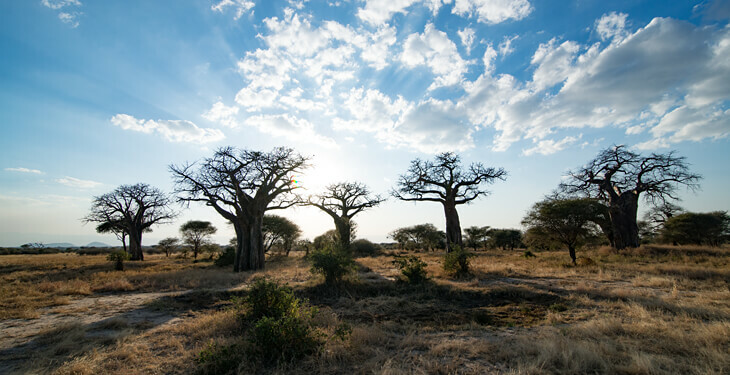 After wrapping up the game drive, it is a 1-hour drive to the campsite, where you'll settle down for a beautiful night of camping under the star-filled sky. This morning you'll depart the campsite at 7:30 am and drive one hour to the Ngorongoro Crater. As you descend into the crater, you may spot rhinos, zebras, lions, wildebeest, and impalas. This UNESCO World Heritage Site was formed by a volcano over three million years ago and is one of the world's prime wildlife viewing destinations, home to many African species. Head toward the lake, which is colored pink by the numerous flamingos wading in the water. Eat lunch next to the hippos and return to the campsite by 5:00 pm. 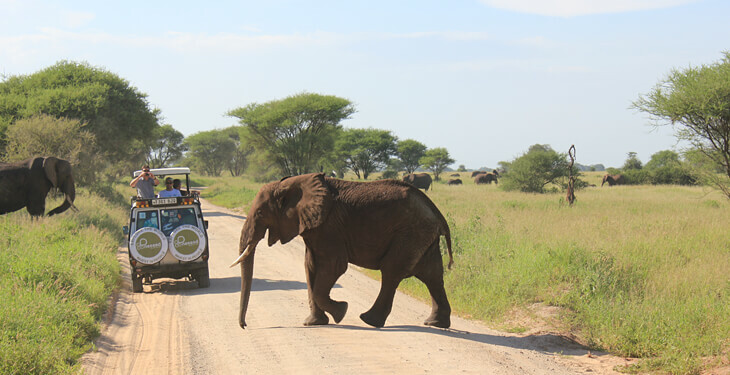 Depart the campsite at 7:30 am and head to Lake Manyara National Park for a short game drive. Watch herds of baboons on the move and in the trees surrounding the car. Return to the campsite for lunch before the 4-hour drive back to Moshi, returning by 5:00 pm. The OneSeed team will provide transportation to Kilimanjaro International Airport for your flight back home. All itineraries are subject to change based on local conditions and the judgment of the guide. OneSeed Expeditions reserves the right to modify the itinerary due to medical considerations or the ability of participants as judged by the guide. When you travel with OneSeed, you explore the world and invest in people. OneSeed Expeditions offers a new way to travel. They partner with local communities to ensure that tourism revenue goes directly to the guides, porters, and local entrepreneurs. Through the OneSeed Fund, they invest 10 cents of every dollar into microfinance initiatives that provide start-up capital for women entrepreneurs. OneSeed practices Leave No Trace principles on all expeditions and they incentivize environmental best practices among their partners. In 2018, they were awarded Gold for "Best in Local Economic Benefit" at the World Responsible Tourism Awards for their innovative work with local communities. Above all, OneSeed Expeditions is committed to operating with respect and mindfulness everywhere they travel. You get a real feel for the community and get to see so much of what the country has to offer through OneSeed trips, which makes it extra special. The fact that you’re helping the local communities by booking through OneSeed is a great added bonus! I would recommend this trip to any of my friends that want an adventure but also a vacation. OneSeed allowed us to go on a crazy adventure but we didn't have to worry about any of the logistics. It was great for us because we love to do adventurous things but don't have the time to spend a month or more exploring the area. OneSeed is very well organized and truly takes care of all the details to make my journey stress free and problem free. All departures are guaranteed! Please wait until you receive confirmation from OneSeed Expeditions before making any travel arrangements. Fly into Kilimanjaro International Airport (KIA), where you'll be met by the OneSeed team and transferred to the lodge for the first night. Group sizes vary, but are rarely more than 10 people. On the trail, you'll be sleeping in mountain huts which are basic mountain lodges with shared dorm-style bunk beds and bathroom facilities. Huts are simple but comfortable spots to rest your head after a long day of trekking. In the cities you'll be staying in lodges or hotels, and during the safari you'll spend a few nights camping as well. Pricing is based on double occupancy (shared rooms) in huts, camping, and the lodge. If you are a solo traveler, OneSeed will try to pair you up with another solo traveler of the same gender, but if this is not possible, you'll need to pay a $250 single supplement to OneSeed Expeditions for your own room. All included meals have two options to choose from (including vegetarian) and also include coffee, tea, and water. Food on the trail is rich in carbohydrates and protein since you'll be burning calories like a champ. Breakfast may include crepes/pancakes, toast, eggs, sausage/bacon, fruit, tea, hot cocoa, and coffee. Lunch may include fried chicken, puff pastry with either spinach or meat/carrots/peas, candy/biscuits, a banana, and hard-boiled eggs. Dinner may include soup, pasta or rice, chicken, beef or fish, avocado/green pepper salad, and fruit. Other options are available for purchase. OneSeed is able to accommodate most allergies and dietary preferences. Please let them know about any dietary requirements at the time of booking. What does the 10% investment in local community (included in my trip cost) go toward? OneSeed provides affordable loans to women living in poverty by investing 10 percent of revenues in trusted local micro-finance banks. The unique nature of these expeditions will take you off the beaten path and allow you to explore the communities supported by OneSeed. Yes. Participants must be at least 16 years old and travel with a parent or guardian. What should I do to prepare physically for the trip? The more prepared you are for the trail, the more you'll be able to enjoy the adventure. For any expedition, the most important thing you can do is get outside and get walking. Break in new gear--especially boots!--and get used to walking on varying terrain (uphill, downhill, trail, etc.). Check the daily mileage of your expedition and use this as a training guide. What safety precautions are taken on the mountain? The personal safety of travelers is the most important priority on the trail, not summiting the peak. The trip is an attempt to summit. Summiting is not guaranteed. Elevation affects everyone slightly differently. Travelers are monitored on the way up the trail for signs of altitude sickness, and suggestions are made to improve these symptoms. If the symptoms get worse, and the guides do not think you should continue, you'll be escorted to a lower elevation. The rest of the group will continue, so there is no concern or pressure. Some travelers choose to use prescriptions such as Diamox to treat altitude sickness. It is recommended that you talk to your doctor about the use of any prescription medicine. You should always hike at your own pace and drink plenty of water. Do I need to tip my guide? Tipping is customary in Tanzania when you have received good service. Tanzania schillings or US dollars are both widely accepted and it is wise to bring small bills. OneSeed suggests daily tip amounts of $5-$8 per day for guides, $2-$5 per day for cooks, and $2-$3 per day for your porters. Depending on the size of your group this might amount to $200 - $400 over the course of the expedition. Can I rent any of the required gear from OneSeed Expeditions? What does the included medical/evacuation insurance cover? Should I purchase trip cancellation insurance too? OneSeed Expeditions includes medical and evacuation coverage in the cost of every expedition through Travelex Insurance. All U.S. and Canadian residents are automatically enrolled. OneSeed Expeditions is unable to provide medical and evacuation coverage to non-U.S./Canadian residents. It is recommended that you purchase trip cancellation insurance, which is NOT included in your cost. It allows you to seek reimbursement if you are forced to cancel your trip for unforeseeable reasons, or if you need to cover medical help, emergency transport, and/or theft or accidental damage while traveling. We recommend World Nomads as a provider. Book confidently with Free Cancellations within 72 hours of booking. After 72 hours, cancellation fees will apply. Cancellations are subject to the full discretion of OneSeed Expeditions. For more information on our Travel Cancellation Policy please Click Here.